Court reporters, also known as stenographers, are the ears of any court proceeding. They record verbatim and create transcripts of legal proceedings, speeches, conversations and official events. Court reporters are needed to preserve the spoken word through accurate records. Find court reporting schools below to start your research. With the advances in technology, court reporters are also often responsible for closed captioning and real-time translations to the deaf and hard of hearing community not just for court proceedings, but also for television shows and news programs. Did you ever want to know what they weren't telling you on TV during a famous trial? Do you like the law and find yourself watching court TV shows regularly? Well now you can know the details and how it all works by taking court reporter classes and join the elite field of stenographers. Court reporters don't just record the spoken word in court proceedings, but in any meeting where official records must be preserved as written transcripts such as board meetings. Court reporters are not limited to being only at judicial proceedings but often help judges and attorneys with organizing and researching official records or in assisting with courtroom administration and procedures. They are also responsible for audio recordings of judicial proceedings if a judge elects to use that method as well as stenography. How Do I Find Good Court Reporting Courses? Court reporter certificate classes don't just teach you criminal, legal and court proceedings; it also teaches you medical terminology, machine shorthand and more. 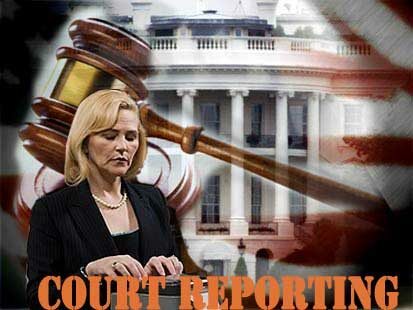 Court reporting courses can give you a either a certificate or an associate's degree. Those undertaking an associate's degree in court reporting will find doors to this exclusive field open more easily. One of the main things to look out for when searching for court reporter classes and schools is to make certain they are approved by the National Court Reporters Association (NCRA). The NCRA has certified more than 60 programs which are offered by 100 vocational schools and colleges. You can find the right school for you by checking locally with vocational schools or colleges in your area, by checking online or contact the NCRA directly for a list of schools offering their certified courses. The NCRA is not accrediting agency, but all NCRA certified programs are accredited by agencies recognized by the Federal government. These courses are just a sample of what you will learn while taking court reporting classes to get your associate's degree in applied sciences with a focus on court reporting. Court reporters can find job opportunities wherever the spoken word must be preserved accurately. You will find careers as judicial reporters, court reporters, broadcast captioner, closed-caption translators, medical transcriptionists, and real-time translators. Court reporters are elite professionals who are in high demand to fill a growing market. The U.S. Bureau of Labor Statistics reported that employment for court reporters will increase up to 25% by the year 2018. Keep the record straight and stay in the know. Find the perfect fit below. If you are looking for an online or campus based court reporting degree program we have what you need. Shorthand – During this course you’ll learn shorthand including phonics. This will increase your speed in which you dictate and allow you to cover more words in a short period of time. Not only will you learn how to write but also how to use a machine for dictation. Computer Systems – Not only will you learn about the different steno machines but you’ll learn about the software needed, how to edit transcripts as well as how to export and save the transcripts. Schools will also typically cover a section on how to keep your software updated as well as trouble shooting techniques. Voice-to-Text Software – Depending on where you work some will allow computerized captioning software programs to be used. Your certificate training program might include an overview. You’ll learn how to speak at up to 200 words per minute and obtain a 97%+ accuracy. Learning how to pronounce words clearly is key to your success which is covered in vocabulary and usage lessons. You’ll learn the correct way to handle certain situations in a courtroom setting including directions from the judge. You’ll cover exhibits and cross-examinations including swearing in the jury or witnesses. Before you enroll make sure to see what your state requirements are in order to get licensed as a court reporter. Some states don’t’ require any licensure. Even if the state doesn’t require one you might want to get licensed anyway as your future employer might require it. If your state does require licensure then it is probably required to take the CVR (Certified Verbatim Reports) exam. The exam could b both written or skills based. Some of the requirements include speed tests that could be as high as 225 words per minute and you’ll need to be 95% accurate. As expected you’ll be working inside as a court reporter unless the court and jury is taken outside under certain circumstances. You’ll be sitting in a courtroom for your job and you’ll be expected to be able to do so for long periods of time. As a court reporter you’ll need to be very detailed oriented as your notes need to be error free. Often what you write will need to be read again in court so listening and communication skills are a must. You’ll be skilled using the stenography method and many programs now teach using the CART system or other voice writing systems. The salary as a court reporter varies where you live in the US as well as how long you have been working. The median salary this year was approx. $48,000 however those in the top 10% of court reporters made over $90,000. This salary would reflect anyone who was working full-time and benefits wouldn’t be included in with those amounts. If you are a freelancer then your annual salary would depend on the number of days you work which could be substantially lower.